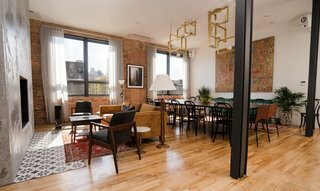 The Publishing House Bed & Breakfast has opened its doors in Chicago’s hottest neighborhood, The West Loop! This urban loft features 11 rooms, a large communal area, kitchen and fully equipped media lounge. Nicole Alexander of Siren Betty Design, in collaboration with Vero Design and Build, and Nusu Architects, brought the vision of owners, Shawn Uldridge and Kimberly Lowery to life. Over the course of two years, Alexander and her team traveled around the country to flea markets to curate the perfect items to achieve a warm, Mid-century modern aesthetic. Built in 1901, the building was first home to the Free Methodist Publishing House. To pay homage to its history, each room in the house has been named after one of the many authors whose works were once printed there. Original pieces of artwork decorate each individual room, with some of the most memorable being the life drawings found in the Carmen room. The communal space exudes a romantic charm, featuring large brass, and frosted globe light fixtures, fabricated by Way Ward Machine Co., a baby grand piano and a double-sided fireplace. Guests can enjoy a little rest, relaxation and reading in the modern library nook, located on the second floor. The built in shelves and lounge benches create a clean, multifunctional space, which compliments its multi-patterned pillows and vintage, Persian rugs. uploaded The Publishing House Bed & Breakfast through Add A Home.